Marriott's Harbour Lake is a tropical vacation ownership resort with Caribbean charm and colorful Key West cottage style, surrounded by the magic and thrill of one of the world's favorite family vacation destinations. Spacious one- and two-bedroom villa rentals feature fully equipped kitchens, separate living and dining areas, screened balcony, and more. Guestrooms with kitchenettes and sofa beds are perfect for a weekend getaway. 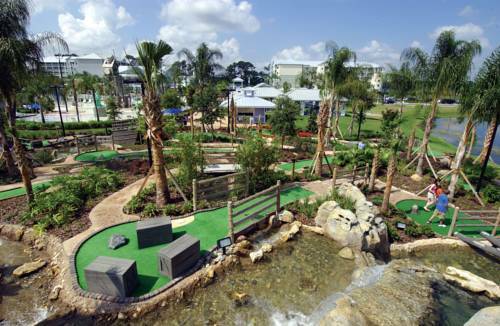 Family fun is a top priority with Key Lime Greens, a 22,000-square-foot miniature golf course and WaterWorks(SM), an on-site water playground. Get ready for fun times at Shipwreck Landing, an exciting themed pool area featuring the incredible pirate ship, complete with water slides and water cannons. Minutes from Orlandos theme parks and top attractions, Marriotts Harbour Lake combines premium rentals with family-friendly amenities, ensuring you enjoy an unforgettable Florida vacation. The Patio Bar and Grill: Closed during inclimate weather. Breakfast, lunch and dinner served along with drinks and Starbuck's beverages. The Outpost: Kiosk serving snacks, grab and go food, drink items, mini-golf packages and pool fun items.